How can we talk about reconciliation when we often can´t find it in our own homes or family? How can we talk about reconciliation when the media presents us an stereotyped profile of a foe or even a country ?. How can we talk about reconciliation when the adversary has KIA our comrade, our brother or a son? Where are the lads who stood with me when history was made? (from the Irish melody The Boys of the Old Brigade) . Did my son die in vain ? How can we talk about reconciliation when were left with a severe disability or the nightmare of PTSD? How can we talk about reconciliation if we didn´t trust wholeheartedly to God who seemed to be absent in the battlefield? How can we talk about reconciliation with someone who´ve never been in battle? How can we talk about reconciliation when our land was overrun and our landmarks decimated? This is no doubt a very old and painful problem for mankind. Reconciliation between Argentine and British forces was most probably coined during the Nottingham International Colloquium which took place on November 17-19, 2006 at Willoughby Hall and later published in the well known book Hors de Combat: The Falklands-Malvinas Conflict in Retrospect published by CCP in UK. 1. Which would be the factors that may promote reconciliation among Argentine and British war veterans? The communication between combatants of both sides was most useful as it allowed them to know what really happened (let us remember that combats like Mount Tumbledown took place at night) and provided historical accuracy. We should remember as well that there were bitter hand-to-hand bayonets fighting in inhospitable conditions.27 and the contact with their opponents help them to cope better with the aftermath. (BBC News Falkland veteran meets Argentine ememy). Communication boost morale and help this men to fight their inner demons.During the visit to Buenos Aires on March 23rd, 2007 Major (ret) Mike Seear 1st Battalion, 7th Duke of Edinurgh`s Own Gurkha Rifles in March 1982, author of Return to Tumbledown told the Argentine artillery gunners (deeply emotionally scarred) of the 5th Marine Infantry Battalion who bombed his unit: You were the best 10,19. They asked him : How do you know we were the best?. Seear replied: Because we have an intelligence service and besides you are Marines and everywhere in the world the Marines are the best force. Major (ret) Mike Seear said: Ultimately we experienced the same thing. We were both scared. Seear recently stated: As a retired British Army officer and combat veteran of that war, it was without doubt the defining and most pivotal period of my life. It pointed out the direction of my life post-war, and made the person that I am now. I did my job in the war, but the latter taught me many things about myself that I did not know pre-war . Later this year Seear called me telling about a British war veteran who was struggling with his PTSD. The idea of having killed an Argentine soldier who was surrendering haunted him. I searched and found an Argentine Marine Corps Petty Officer war veteran who was on the same spot than this British veteran. The former told him (what we suspected) and it was that such a thing could never have happened at the time he described. Once again the testimony of the opponent had a tremendous impact on the recovery of a war veteran. Since November 1993, at UNFICYP (United Nations Peacekeeping Forces in Cyprus) Argentine and UK forces operated together in Cyprus controlling 3 percent of the island territory. In Cyprus 18 the Mobile Force Reserve (MFR) was under a British Major command while an Argentine second in charge operated a section. Commander Juan Carlos Ianuzzo, secretary of an important Argentine war veteran´s association (AVEGUEMA) told me that there was a high professionalism and no place for hate. Both sides recognized the courage of the adversary, especialy the one displayed by the British units. As a matter of fact two British war veterans are members of this Argentine association. Commander Eduardo Villarraza of the Marine Corps 5th Battalion who fought in Mount Tumbledown said: On the other hand, the military knows that war is the last option to solve conflicts and besids its the most expensive one. As we know its costs its obvious than is better to solve with dialogue as many conflicts we have. Maj (Ret)Mike Seear said: There has never been any hate directed towards your former enemy on the battlefield. So there is no hate to extinguish when you meet them in such a meeting. However the key point to make is that those you are now meeting in peaceful circumstances had been trying to kill you during the war, and you had been trying to kill them. It is therefore an emotionally-charged meeting – and one, in my humble experience, that always generates a ‘good vibrations’ feeling. Therefore my participation in such meetings have always, without exception, been successful and rewarding. Why? It is because you have made a sincere attempt to get to know your former enemy who previously has just been a faceless and nameless one. The memory of these meetings, just like the war, stays with you for the rest of your life. According to Cliff Caswell of Soldier magazine: British and Argentine veterans share one specific quality. There is a recognition that both sides conducted themselves properly in their duty, in accordance with the rules of battle, and have values of respect and loyalty in common. Max Hastings and Simon Jenkins stated that the 1982 conflict was fought with remarkable respect for decency on both sides. The International Committee of the Red Cross also gave the beligerent partis a broadly clean bill of health in their 1985 report. reconciliation is a meaningless concept"
These Argentine and British men who fought for cause and comrades did not obtained in due time the expected support from their goverments. 2. Which are the factors that work against the reconciliation between Argentine and British war veterans? The main barrier is purely distance (7391 miles), although technology has certainly helped a lot to comunicate combatants of both sides. Mike Seear said: ¨ The ultimate for a combat veteran must be to walk in slow time and during daylight the old battlefield with his former enemy in a group as pointed out in my book (Return to Tumbledown). Surviving US Marine Corps veterans of the 1945 Battle of Iwo Jima with their surviving former Japanese opponents did just this on Iwo Jima in 1970. So why, in principle, cannot Argentine and British veterans of the Falklands-Malvinas War do the same? Because of political objections from the Islanders (of whom less than 10% who experienced the war are still living on the Islands)?. The very same concept was issued by 51 years old Argentine conscript Jorge Alberto Altieri Infantry Regiment 7 ¨Coronel Conde¨, Company B who fought in Mount Longdon. Altieri was wounded by artillery fire and left with a severe disability. The United Nations Special Committee on Decolonization approved on 20 june 2013 a draft resolution on the question of the Falkland Islands (Malvinas) by which the General Assembly would reiterate that the way to end that “special and particular colonial situation” was the peaceful and negotiated settlement of the sovereignty dispute between the Governments of Argentina and the United Kingdom. 3. Which would be the factors that may promote reconciliation among Argentine and British civilians ? Time has healed many wounds already and as Marianne Williamson founder of The Peace Alliance said: The practice of forgiveness is our most important contribution to the healing of the world. There is no timetable to this grieving process. We should remember, mainly in the case of the ARA General Belgrano´s conscripts that the death of a son is the most devastating loss and the life of their parents are forever changed.. Each parent´s journey is different. A brain doesn´t work right when a heart is broken. Commodore (Ret) Toby Elliott said: The general UK population feels no animosity towards the Argentinian people, only towards its 1982 government. Cliff Caswell added: Soccer is actually a tremendous leveller. In the Premier League in the UK there have been many celebrated Argentine players, such as Carlos Tevez, and British children look up to them as role models and want to emulate them. There is an entire generation who do not remember the events of the war, and people who do not know where the islands are. I do not think reconciliation between civilians is required. 4- Which are the factors that work against the reconciliation between Argentine and British civilians? First Officer Radio Operator (Merchant Navy) Francisco Elizalde decorated by the Argentine Navy said : The Argentine civilians, among whom I am included despite my war veteran condition , shift from a fanatical devotion to a total indifference on the subject. The conflict never precluded us from keeping in contact with the British people.Only the bigots did that. It's been over 30 years now, we should have grown up (not only regarding the islands) thus being able to resolve the conflict peacefully. We have a common past deeper than that perceived by most people. We still use the standard British meat cuts, not the Spanish or Italians which are our two Mother Countries. I understand that we´ll reconcile when, with humility, we understand the other´s position and his achievements. Bigotry and politics separate veterans and non-veterans while humility, and acknowledgment of the oponent brings us together under any circumstances. 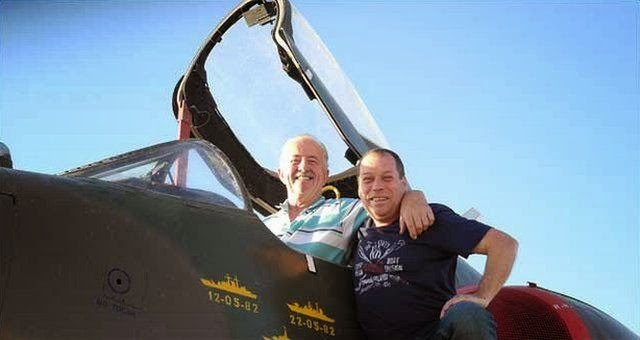 War Veteran Marcelo Eduardo Ducuing (Fénix squadron) said: it would be great that Argentine and British could present historical proofs about the islands and to debate them. I would add in an appropiate forum and with a neutral partaker. There have been troubles even with official stories 11. In any case good historical writing is analytical, precise, accurate and interesting and follows a method and no doubt both countries have superb historical institutions. According to the Uppsala Conflict Data Program, ongoing military conflicts in the world are causing more than 1000 deaths per year. Notwithstanding, conflicts are not definitive. Cannon Paul Oestreicher former director of the Centre for International Reconciliation who received the Order of Merit of the State of Saxony said: Maybe a few have accepted that in war ,however just the cause, no one emerges with clean hands. Saying sorry is not a sign of weakness. Three institutions have created the path to reconciliation: The Community of the Cross of Nails, the Call of Dresden and the Aktion Suehnezeichen Friedensdienste (ASF). To these we should add the French and German reconciliation. On 14 November 1940, 515 Luftwaffe bombers from Luftlotte 3 and 13 specially modified Heinkel 111 of the Kampfgruppe 100 equiped with X-Gerät navigational devices made one of the most severe attacks intended to destroy Coventry´s factories in what was called Operation Mondscheinsonate (Moonlight Sonata). High explosive bombs were followed by incendiary bombs of magnesium and petroleum. At around 20.00hs the 14th-century Gothic church of St Michael (later Cathedral) built on the site of a Benedictine monastery was set on fire.In one night, more than 4,300 homes in Coventry were destroyed and around two-thirds of the city's buildings were damaged. An estimated 568 people were killed in the raid with another 863 badly injured and 393 sustaining lesser injuries. The ruined Coventry Cathedral was left as a ruin and is today still a reminder of the bombing. A new cathedral was constructed alongside the ruin in the 1950. In 2011, the ruins were designated as a memorial to all civilians killed, injured or traumatised by war and violent conflict world-wide. In order to commemorate these civilians, the Cathedral chose six themes to guide its focus: aerial bombing, refugees, sexual violence as a result of war, landmines, child soldiers, and the environmental impact of war. Shortly after the destruction, the cathedral stonemason, Jock Forbes, noticed that two of the charred medieval roof timbers had fallen in the shape of a cross. He set them up in the ruins where they were later placed on an altar of rubble with the moving words ‘Father Forgive’ inscribed on the Sanctuary wall. Another cross was fashioned from three medieval nails by local priest, the Revd Arthur Wales. Another cross was made of three nails from the roof truss of the old cathedral by Provost Richard Howard of Coventry Cathedral. Howard made a commitment not to revenge, but to forgiveness and reconciliation with those responsible.The cross of nails has become a symbol of peace and reconciliation across the world. There are over 160 Cross of Nails Centres all over the world, all of them bearing a cross made of three nails from the ruins, similar to the original one. One of the crosses made of nails from the old Canterbury cathedral was donated to the Kaiser Wilhelm Memorial Church (Kaiser-Wilhelm-Gedächtniskirche) in Berlin which was severely damaged as well in an air raid on 14 November 1940. A replica of the cross of nails was also donated to the Chapel of Reconciliation (Kapelle der Versöhnung) which forms part of the Berlin Wall Memorial. The first confirmed kill made by HMS Coventry was an Aérospatiale Puma helicopter of 601 Assault Helicopter Battalion, shot down by a Sea Dart over Choiseul Sound, killing its three man crew. On May 25, 1982 ,the HMS Coventry was attacked then by FAA Argentine A-4 Skyhawks and was struck by three bombs just above the water line on the port side. (BBC News Falkland veteran meret Argentine ememy) Within 20 minutes it capsised. Nineteen of her crew were lost and a further thirty injured. The cross of nails was later salvaged by Royal Navy divers and presented to Coventry Cathedral. As the spiritual home of the Community of the Cross of Nails, St Michael's House has been launched as a dedicated space for skills-based learning and intellectual encounter alongside theological reflection and spiritual resources for reconciliation. St Michael's House is also a dedicated space for facilitating conversations around questions of identity, difference and conflict in the church and wider society. On the night of 13/14 February 1945, more than 4,500 tons of high explosives and incendiary devices were dropped on Dresden, capital of the German state of Saxony and known before the war as ‘Florence on the Elbe’. A terrible firestorm resulted, creating temperatures of up to 1000°C in parts of the city. Current estimates suggest that 35,000–40,000 people were killed; and at least eight square miles of the city were totally devastated. The areas of strategic and military significance, like the transport system, were left relatively untouched. The strategy of bombing German cities owed much to Arthur Harris, chief of Britain’s Bomber Command. Harris believed that ‘area bombing’ would erode the morale of the German population and hasten the end of the war; the earlier strategy of attacking economic and industrial targets had not proved very successful. Alan Russell, co-founder and Chairman of the Dresden Trust believes that, according to the canons of war existing in 1939, the Dresden raid was morally wrong and had something criminal about it. It was a war crime. ‘It wasn’t wrong to bomb Dresden, but it was wrong to bomb it in the manner in which we did. We deliberately bombed a historic city. I personally can’t justify it'. Some kind of atonement was needed a public recognition that Britain’s own moral record needed examination. In 1990, shortly after the collapse of the Berlin Wall, a group of distinguished Dresdeners issued an international appeal now known as the ‘Call from Dresden’. They called for financial aid for the reconstruction of the Frauenkirche (Church of Our Lady), which had been destroyed in the bombing. 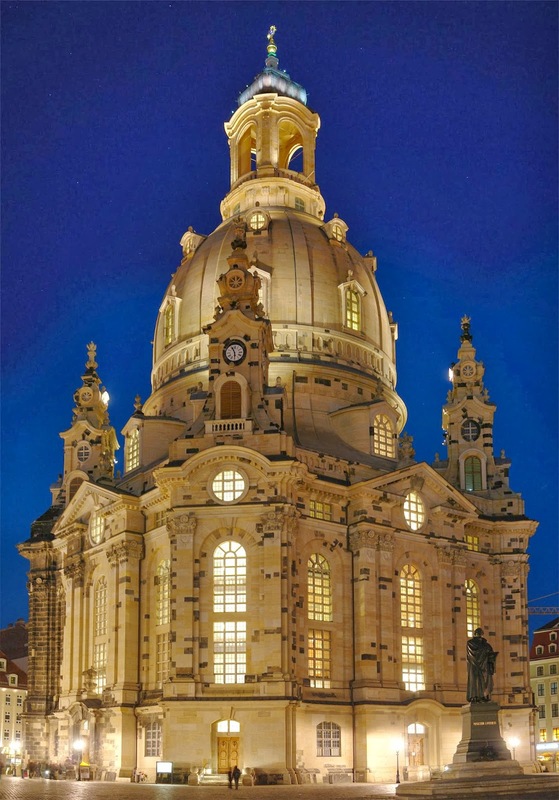 The Frauenkirche project gave the Trust a material focus for its attempts to foster British-German reconciliation. Russell and his fellow trustees brought the history of Dresden and the needs of the Frauenkirche to the attention of the British public. They soon discovered that there were many people in the UK who loved German culture and wanted to contribute to a project that could enhance British-German relations. Almost £600,000 was raised in few years. with a bell-shaped dome that rivalled those of St Peter’s in Rome and the Duomo in Florence. ‘profound, reflective, long-term process, requiring justice, freedom, forgiveness and love’. In 1963 a group of young British volunteers went to Dresden, in East Germany, to help rebuild a hospital destroyed during the Allied bombing onslaught of February 1945. Hardy Kluge, former co-ordinator of ARSP in the UK described these early exchanges as ‘the first efforts of young people to produce symbols of reconciliation, to pave the way towards a better mutual understanding and, thus to a more beautiful world’. Between 1961 and 1996 more than 600 young Germans worked as ARSP volunteers in the UK, primarily in five British regions, which were socially and economically deprived. Volunteers worked at projects throughout London, at the Corrymeela reconciliation centre in Northern Ireland and built a social centre in Glasgow, amongst others.Since 2001 ARSP has been running a trilateral programme with volunteers from Poland and Germany. On July 8th, 1962 Chancellor Konrad Adenauer and Charles De Gaulle (both Roman Catholics) went to the Cathedral of Reims for a Mass. ¨Excellency, Chancellor Adenauer and myself come to your cathedral to seal the reconciliation of France and Germany, " said De Gaulle to the Archbishop of Rheims, Bishop Marty . Adenauer and De Gaulle sit together in the choir. Auxiliary Bishop George-Stanislas-Béjot assisted by Monsignor Lallement and the priest Lucien Hess celebrated the Mass of Reconciliation. Llalement was prisoner of war and Hess was tortured by the Gestapo and deported to Dachau. The 1963 Elysee Treaty marked a milestone for two countries that had fought three wars in 70 years. Since then, they've cooperated closely on economic and cultural issues. On January 2013 Chancellor Angela Merkel and President Francois Hollande marked 50 years of reconciliation with Cabinet, Parliament gatherings. Peace isn´t the absence of conflict, but the transformation from destructive tension into dynamic creativity, the turning of the competition that presupposes scarcity into the complementarity that assumes abundance, the emergence of thankfulness in place of resentment, and the retelling of a story that ceases to believe stray elements can or should be written out the script. Jesus´s path to resurrection lay through the cross, and our path is the same. What the scriptures teach us is that we can often be closer to the mystery of God in times of wilderness and exile than in the much-longed-for destination, and that Jesus´cross ultimately delivers us from the worst effects of our own. Albon, Christopher-British military suicides in the Falklands and Iraq. Conflict Health-Oct 10, 2008. Bingham,John-The Bishop of Coventry: If we can forgive we will always have hope-The Telegraph 22 May 2012. Bragg,Billy-Jingoism is no answer to England´s ebbing power-The Guardian 17 February 2012. Caswell, Cliff-Reconciled-Soldier: The magazine of the British Army-June 2007. Copping, Jasper-Official British history of the Falklands war is considered too pro-Argentina-The Telegraph 27 February 2010. Giaquinta, Carmelo Juan Monseñor-Obispo Auxiliar de Viedma-Iglesia,Comunidad Nacional y Reconciliación-Boletín de la Diócesis de Viedma, 1981, pp. 27-41. Izzard, Jack-Falkland enemies met at last-BBC News-1 April 2007. Placid Garcia-Planas-La reconciliación entre Alemania y Francia cumple 50 años-La Vanguardia –Julio 8 , 2012. Radu, Roberta-Falklands war TV drama tells forgotten story of Argentina´s soldiers- The Guardian-14 April 2013. Reinhold, Barbara-El estereotipo del ¨macho¨argentino-Clarín-18 febrero 2013. Wells, Sam-The exasperating patience of God-Faith in Conflict, Coventry, Tuesday, 26th February 2013.